Set price precision and price rounding strategy. Configure default price lists, their priority and merge strategy to get the necessary resulting combination of prices that are shown on the websites and for the customers whenever their price list settings fall back to the system default. Specify an offset in hours that helps launch combined price list recalculation before price change is activated. Enable all or some currencies from the allowed currencies list to be used in OroCommerce storefront and management console. 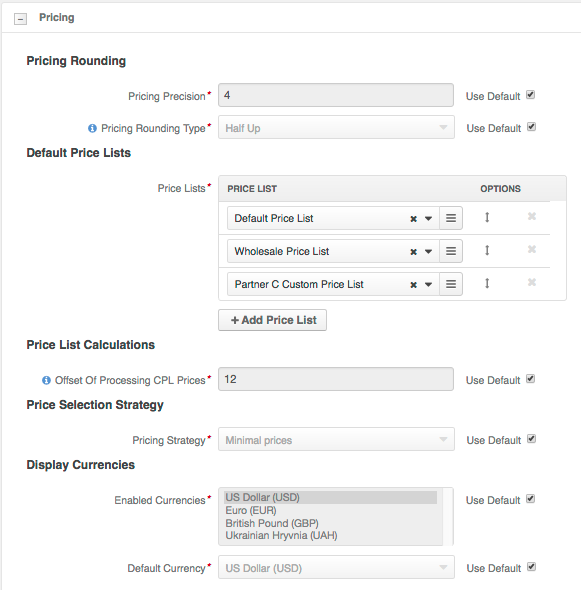 Select the currency that is shown by default in the OroCommerce storefront and management console. The website level configuration has higher priority and overrides these configuration settings. Customer group configuration overrides configuration on the website level. Custom configuration on the customer level has the highest priority. Select Commerce > Catalog > Pricing in the menu to the left. Pricing Precision — The number of digits that are allowed in the fractional part of the price (e.g. precision of 4 enables your sales manager use prices like $10.0001). Price Lists — A set of default price lists that may be used for price calculation. Website, customer group, and customer may have their own set of price lists that overrides the default configuration. Price lists with higher priority are on top. Offset Of Processing CPL Prices — An offset (in hours) from the scheduled price change that determines how early the price list recalculation and reindex should happen to prepare the actual prices in the OroCommerce storefront for the scheduled launch. Delayed recalculation helps spread resource-consuming tasks in time and launch them only when the price is going to be used soon. This eliminates unnecessary intermediate recalculation every time the price is updated between the time price list schedule is added and the time when recalculation is expected to start (considering the offset from the scheduled launch). If you update the price once a week, set the offset to 40 (hours). If you update prices more frequently, set the value that approximately matches the delay between the updates of the price information. It may be aligned with the data synchronization process between your OroCommerce and the external ERP system. For continuos price updates use the minimal recommended offset value of 0.083 (5 minutes). Pricing Strategy — The strategy that is used for a price lookup. Using Merge by priority strategy — OroCommerce walks through the default or customized set of price lists starting with the price list of the top priority and moving along to those with the lower priority. When the product price is initially found in the price list with the Merge Allowed option enabled, the price and the price list priority is collected for further evaluation and merge. Prices for other units and for other tiers of product quantity may be collected form the same price list and from other price lists with the Merge Allowed option enabled. The tier/unit prices with the highest priority are shown to the customer user. When the product price is initially found in the price list with the Merge Allowed option disabled, OroCommerce collects the product prices for all units and for all tiers of product quantity from this price list only. Other price lists are not taken into account, as price merge is not allowed. The units and tiers of quantity where the price is missing are hidden from the customer user. Enabled Currencies — The subset of allowed currencies that is available for the customer user by default. The Display Currencies field is only available in the Enterprise edition. The website level configuration has higher priority and overrides the global configuration settings. Default Currency — The currency that is used by default to show prices in the storefront. Select or type in the new option value. Click + Add Price List and select the price list in the newly added line. After you start typing the price list name, the list of suggestions that match your entry appears. Press Enter or click the suggested value to add the price list. The price list is appended to the bottom of the list and, initially, has lower priority then existing price lists. Adjust the price list priority if necessary and specify whether the merge is allowed (the later is shown only for the Merge by priority price selection strategy). When merge is allowed, the prices for the tiers and units that are missing in the higher priority price list may be covered by the prices from the lower priority price lists that should support price merge too. To delete a price list from the default price lists, click the Deactivate at the end of the corresponding row. To roll back any changes to the currency settings, click Revert on the top right.